Senate Majority Leader Mitch McConnell (R-Ky.) during a weekly news conference on Capitol Hill on Tuesday, Dec. 12, 2017. 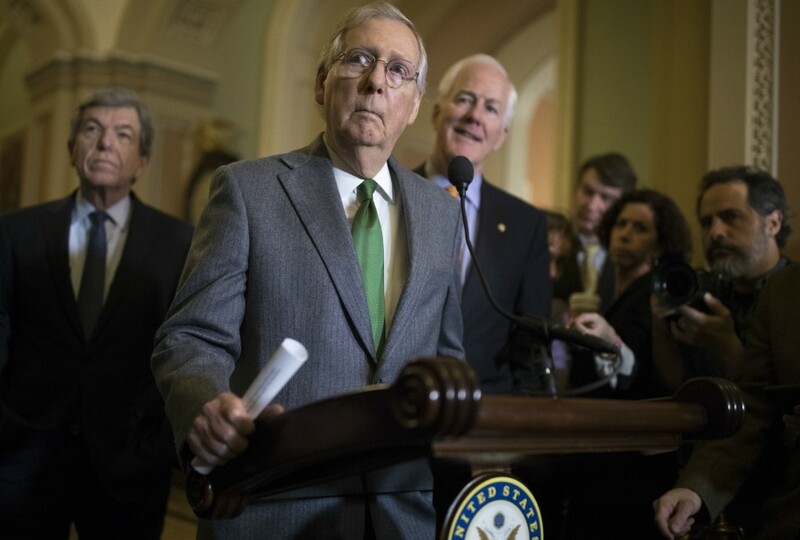 House and Senate Republicans have reached an agreement, in principle, on a consensus tax bill on Wednesday, keeping the party on track for final votes next week with the aim of delivering a bill to President Trump’s desk by Christmas, according to people briefed on the deal. WASHINGTON — A group of Republican lawmakers tasked with merging the House and Senate tax bill signed a final version of the legislation Friday, a key step that will allow the full text of the bill to be released later today and voted on early next week. The bill was finalized with a last-minute change to expand the child care tax credit so that it benefits more low-income Americans, a move intended to win back the support of Sen. Marco Rubio, R-Fla., who on Thursday said he would not vote for the bill without a more generous provision. “The conference committee has come together and we have delivered for the American people,” Rep. Kevin Brady, R-Texas, chairman of the Ways and Means Committee, told reporters around midday, adding that the final tax bill would be made public later Friday. A late change intended to shore up Rubio’s support would allow 70 percent of the $2,000 per-child tax credit to be refundable, up from 55 percent in the original draft of the bill, according to lawmakers and those briefed on the change. The change would allow families with no tax liability to claim up to $1,400 in tax refunds per child, up from $1,100 in the version that passed the Senate earlier this month. Even if he were to oppose the final bill, Rubio would not by himself stop the legislation from making its way to Trump’s desk, as Republicans hope to do next week; the bill passed the Senate with one Republican vote to spare, and if Rubio were to defect, Vice President Mike Pence could still break a tie in the bill’s favor. If other Republicans were to also break ranks, the bill would lack the votes needed for passage. At least two other Republican senators remained publicly undecided on Friday morning: Mike Lee of Utah and Susan Collins of Maine.